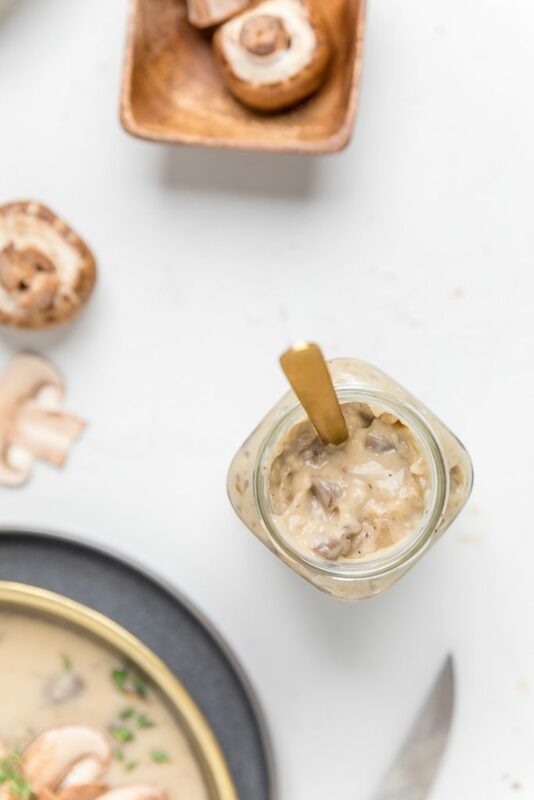 This easy vegan cream of mushroom soup is better than any canned soup you could buy! Full of flavor and ready in just 15 minutes. Of course this is a dairy free cream of mushroom soup as well, and can be tailored to be Top 8 Allergen Friendly. 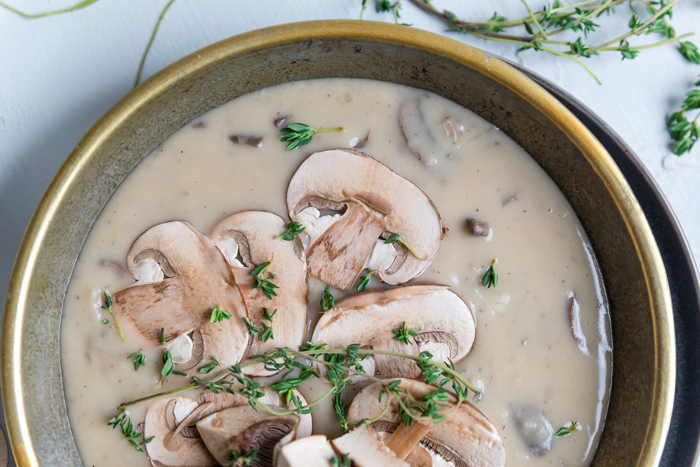 We share varieties for vegan condensed cream of mushroom soup or actual soup. You’re either a fan of mushroom or you’re not. It’s definitely one of those controversial foods, but if you are here and reading this, then you are likely a fan. There are a lot of reasons to avoid a jar of canned cream of mushroom soup. For starters, if you are here, then you are dairy free or vegan and canned soups are neither of those. They are loaded with a cream base and also a lot of additives that aren’t necessary. 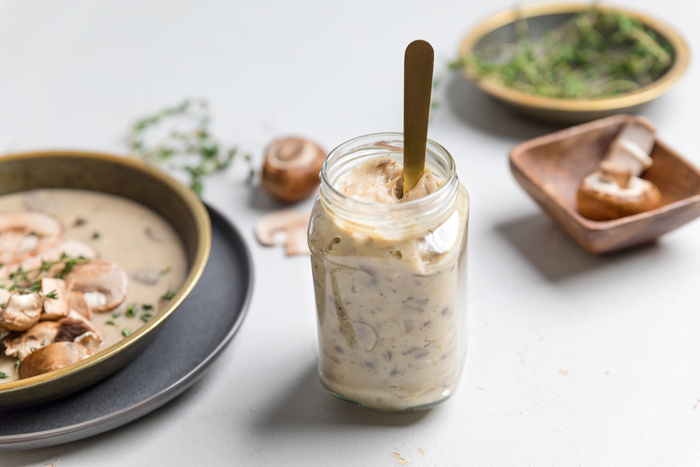 Luckily, this vegan cream of mushroom soup can be tailored to whether you need a condensed version for casseroles and such or an actual soup for those colder days! 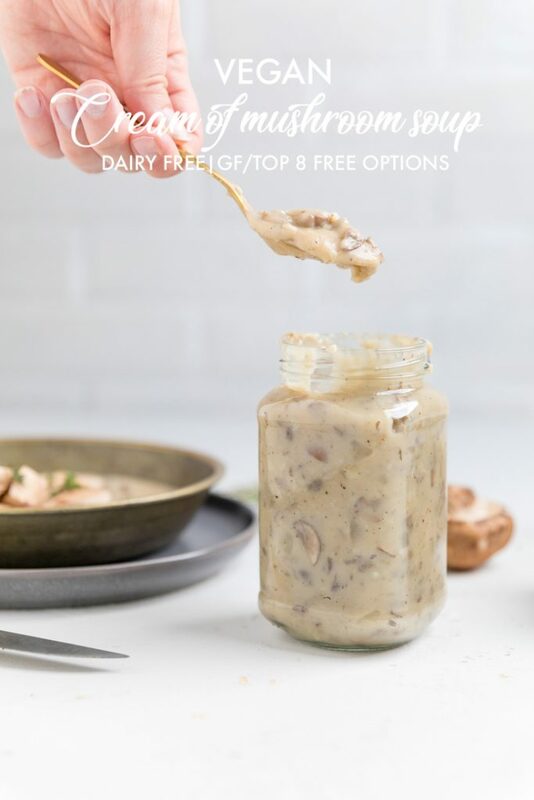 This vegan cream of mushroom has minimal ingredients and is super quick and easy to make. We are sharing multiple versions for how you can make it, including how to make this Top 8 Allergen Friendly! What ingredients do you need to make vegan cream of mushroom soup? That’s it! Just 9 ingredients plus salt & pepper! 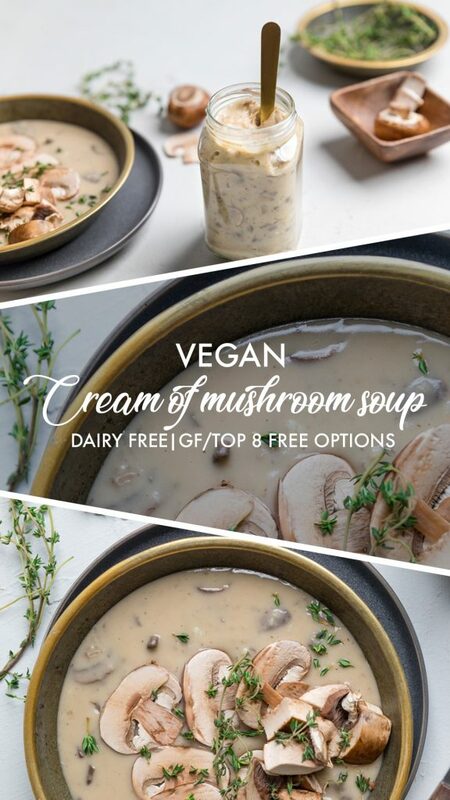 How do you make vegan cream of mushroom soup? The first thing you are going to do is chop your mushrooms, onions, and garlic. Once you have those chopped, add your butter to a skillet over medium heat and melt. Once almost completely melted, add the onions. Cook for 3 minutes and then add the mushrooms. Cook for another 2 minutes. Add in the garlic, nutmeg, thyme, salt and pepper. Cook for another 2 minutes. Add your flour and stir to combine. This is going to make a thick mushroom roux. Add your almond milk and vegetable stock. Stir until very well combined. Taste and adjust seasonings if desired. Remove from heat and use immediately or let cool and store in air tight container for up to 1 week. Keep reading below for more tips! Is this more like Vegan Mushroom Soup or Vegan Condensed Cream of Mushroom soup? We are actually sharing recipes for both a thicker condensed cream of mushroom type of soup and for a saucier dairy free mushroom recipe. They both use the same amount of ingredients with just a simple switch in the amount of liquid. The condensed version is perfect for casserole type of dishes and the soup version is great to warm you up on a chillier day. To make a condensed version you add less liquid and then can later go back and add more if you want to make a soup. 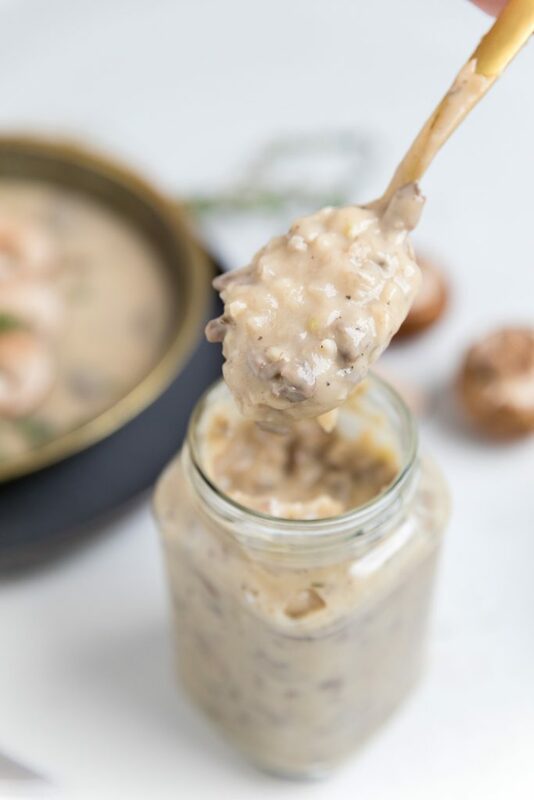 Can I make this Top 8 Allergy Friendly cream of mushroom soup? There are two ingredients that fall under the Top 8 Allergens. Those are regular flour (wheat) and the almond milk. You can swap the flour for chickpea (garbanzo bean) flour and it works perfectly. Alternatively, you can replace all the almond milk with an equal amount of added vegetable stock. If you make those two really easy swaps, this will be a completely Top 8 Allergy Friendly recipe. 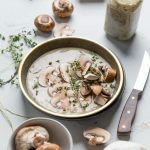 What type of skillet should I cook this vegan cream of mushroom soup? We love cooking this in a cast iron skillet. However, you should note that cooking in a dark skillet like this will make the color darker than what is picture. 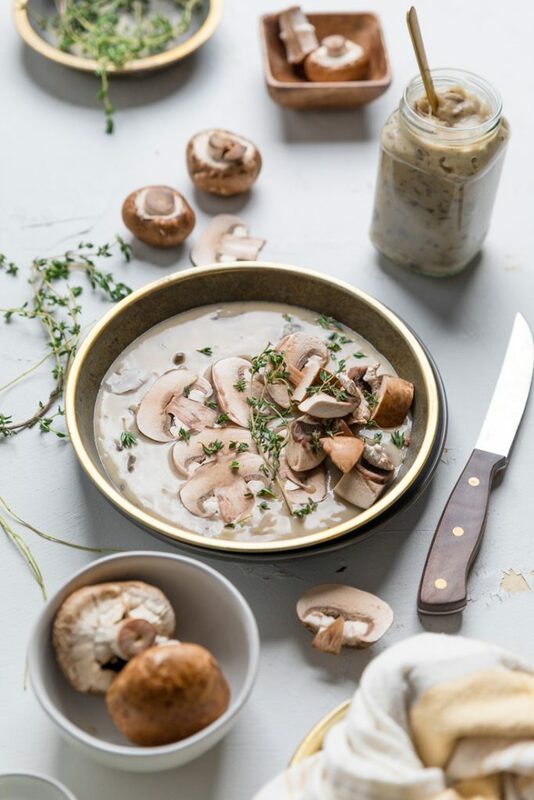 It doesn’t change the taste of the vegan cream of mushroom soup and it does add more nutrients, so if the color doesn’t bother you then go for the cast iron. Otherwise, green pan is our favorite skillet. Do I have to use almond milk or can I use all vegetable stock in this vegan mushroom soup? 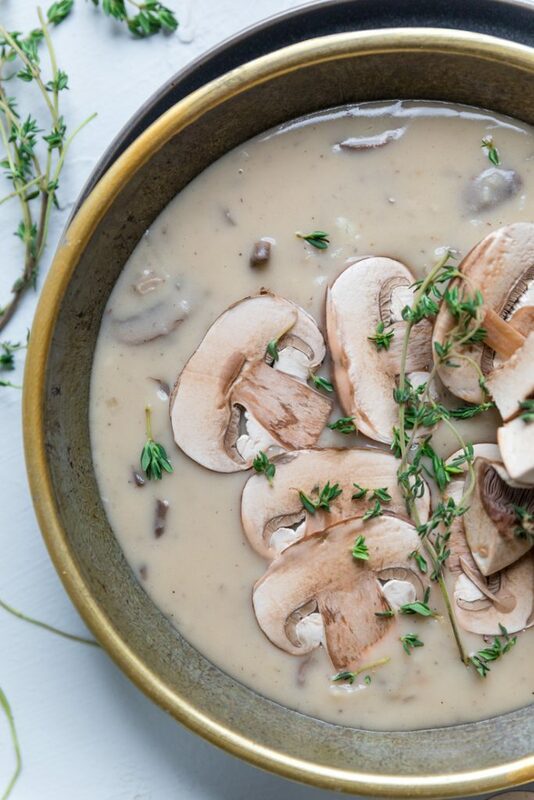 For this dairy free mushroom soup, you don’t have to you the almond milk at all. We did test with only vegetable stock and we loved the flavor even more, but it did make the cream of mushroom soup darker and not a creamy like color that you would expect. If you aren’t worried about the color, then you can just do the stock. 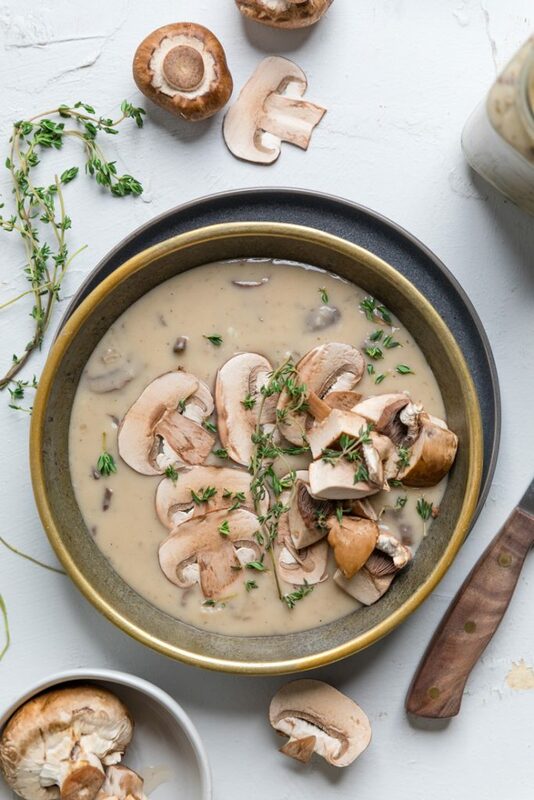 Can I add more mushrooms to this vegan cream of mushroom soup than called for? We tested this recipe multiple times, we 4, 6 and 8oz of mushrooms. All versions turned out great. The 8oz were a lot for the amount that is being made, but if you want to use the whole container, you can. We did end up using 4oz in the final version that is pictured, but anywhere from 4-8oz would be fine. What are other vegan mushroom recipes that I can try? Chop your mushrooms, onions, and garlic. *For the mushrooms, dice them as small as you actually want them to be in the regular or condensed version of the soup. For condensed we usually do very fine dice, for a soup, we usually do larger or sliced. To a skillet over medium heat, add butter. Once almost completely melted, add the onions. Cook for 3 minutes. Add the mushrooms. Cook for another 2 minutes. Add in the garlic, nutmeg, thyme, salt and pepper. Cook for another 2 minutes. Add your flour and stir to combine. This is going to make a thick mushroom roux. Add your almond milk and vegetable stock. Stir until very well combined. *If making a condensed version of cream of mushroom soup, add 1/2 cup vegetable stock and 1/2 cup of unsweetened almond milk. *If making a mushroom soup, add 1/2 cup of unsweetened almond milk and 1 cup of vegetable stock. Adjust for desired thinness of soup. Remove from heat and use immediately or let cool and store in air tight container for up to 1 week. *Please see notes in the post as we give a lot of tips about this recipe.